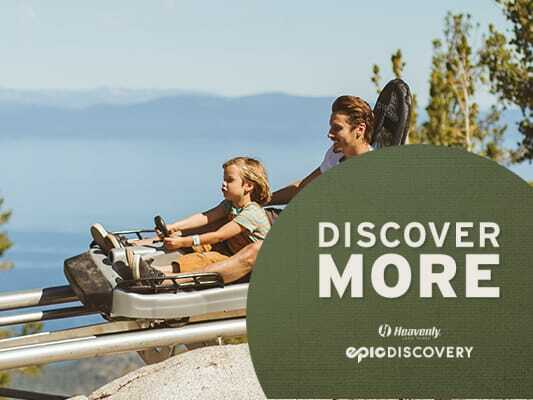 This gravity-powered alpine coaster will exhilarate you and your family as it coasts through forest and natural rock formations. As always the views are incredible and the memories will be too! The coaster sleds fit up to two riders, so you can enjoy this activity with others. Activity Restrictions: Drivers must be at least 16 years old (if accompanied by a passenger), between 54 - 84" tall. Closed-toed athletic shoes are required for all activities. Please call to check availability and pricing 1 (800) 432-8365 (Option 7). This product is no longer available online. Please call 1 (800) 432-8365 (Option 7) for walk up availability. A day filled with extraordinary moments and activities, including the Scenic Gondola Ride to the top of Heavenly Mountain.